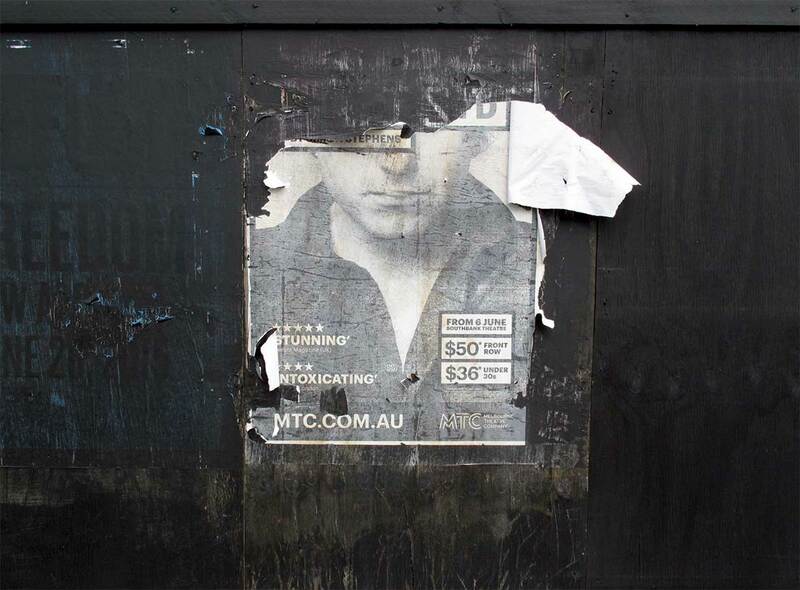 When Wolfgang Sievers was a young man in Germany, just before he emigrated to Australia, he studied at an art & design school in Berlin, the Contempora (Contempora—Lehrateliers für neue Werkkunst). Sievers spoke warmly about his experience there, saying it was the most intense education he ever had. He liked its practicality: following classes in the morning the school turned into a professional studio in the afternoon, and students worked on real commercial jobs. Sievers himself was often put in charge, and was offered a teaching position when he decided to emigrate to Australia. The school lasted only a few years, from 1932 to 1939, at the start of World War II. You can imagine the difficulty of running an education business in that turbulent era in Nazi Germany. 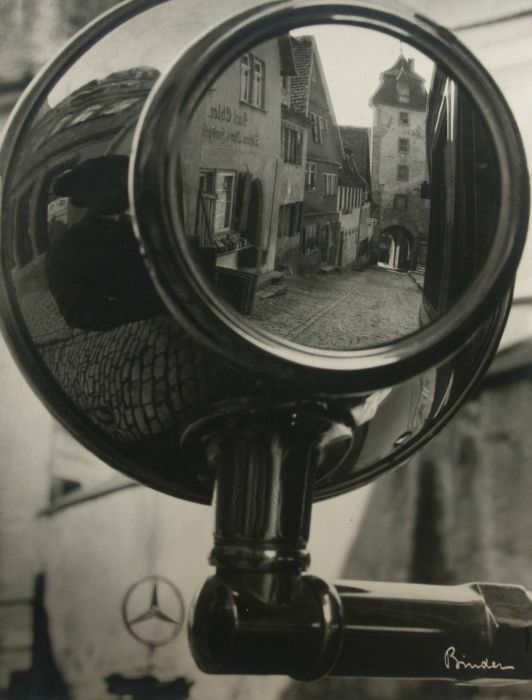 Its founder was a prominent architect, Fritz August Brehaus, but the man in charge of the photography department was Erich Balg (1904-77) a prominent photographer in Germany for many years. Balg worked for the fashionable Atelier Binder in Berlin before helping Brehaus establish the Contempora. He survived the war and continued as a commercial photographer in Hamburg into the 1960s. 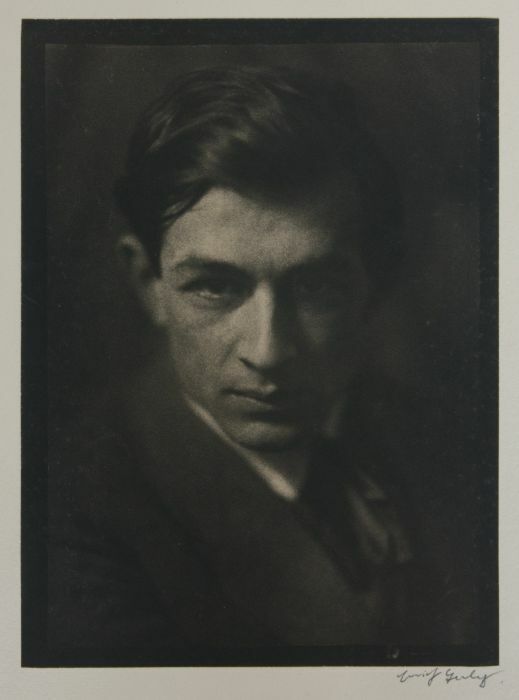 His photographs are documented at www.erich-balg.de. and show his evolution from dark moody Pictorialism in the 1920s through to clinical commercial photography in the 1950s and 60s. I prefer the warmth of his earlier work. 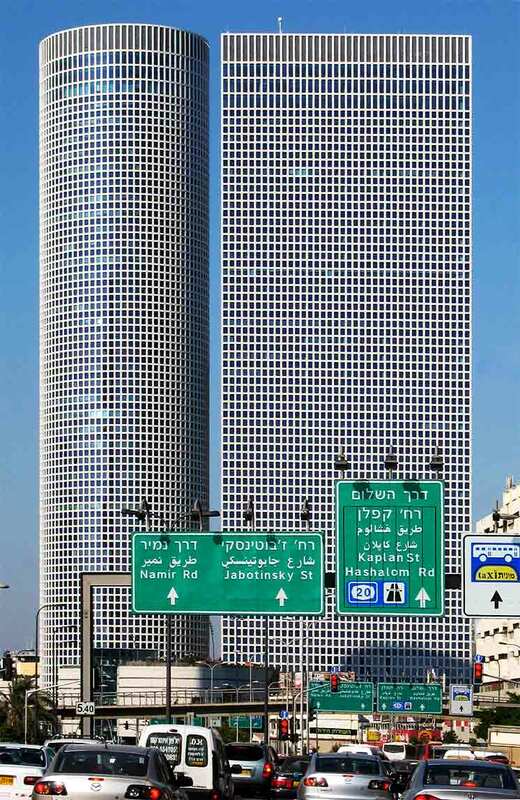 The Azrieli Center in Tel Aviv was designed by Israeli-American architect architect Eli Attia, It’s geometric order and precision rises serenely over the chaos of highways beneath it. This 2007 photograph shows the circle and triangle towers, but since then, the square tower has gone up. 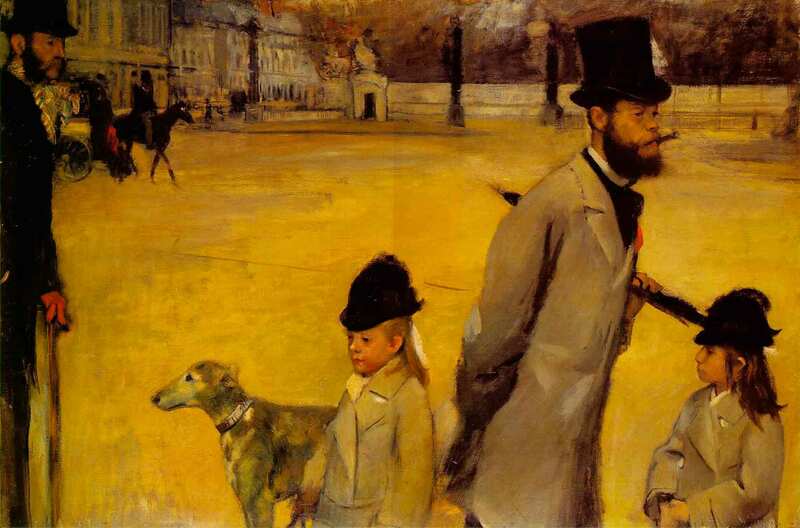 The National Gallery of Victoria (NGV) has announced its 2016 Winter Masterpieces blockbuster, Degas: A New Vision. 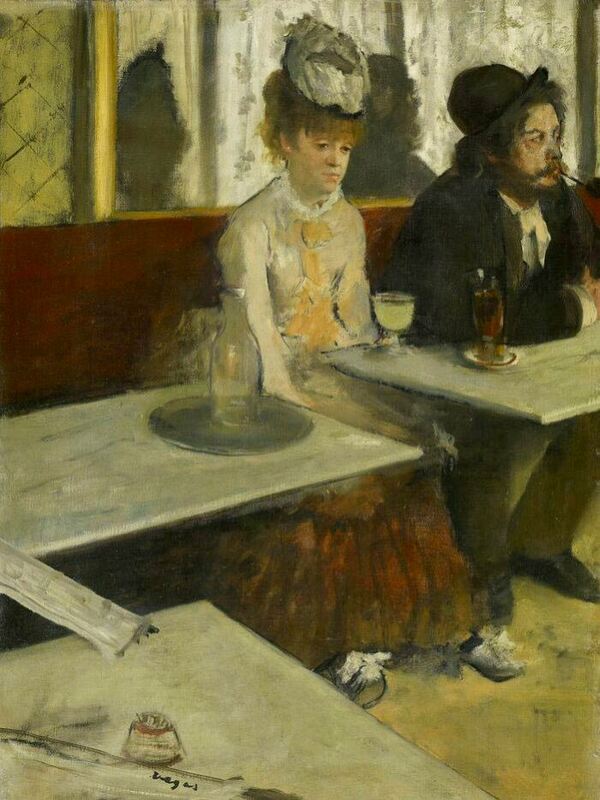 Edgar Degas was one of the key Impressionist painters in the late 19th century. 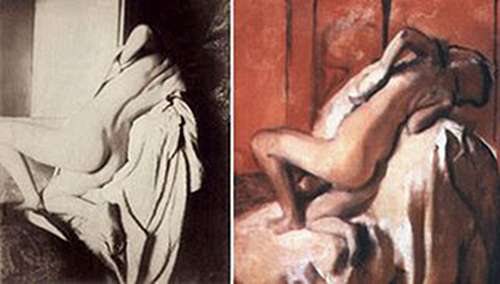 Degas is particularly relevant to photographers because he was one of the earliest painters to show incorporate a photographic vision in his art. A keen photographer himself at the dawn of amateur photography in the 19th century, he used the medium to record subjects for his paintings. 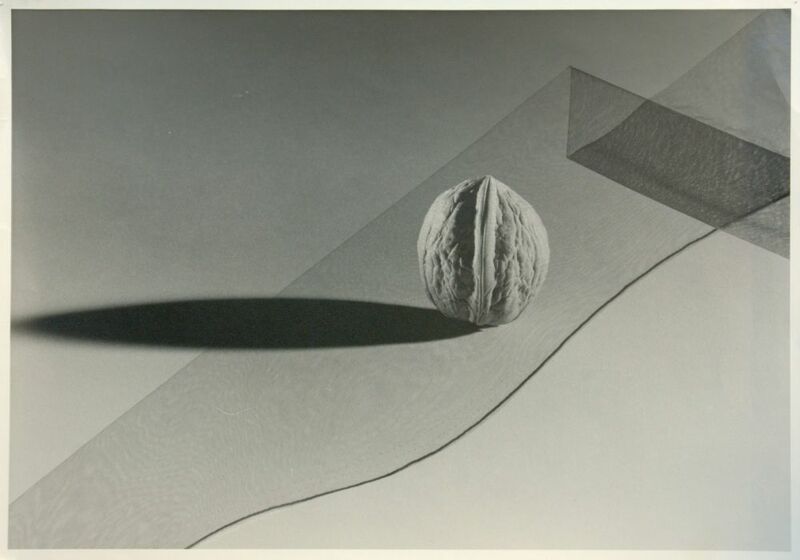 In doing so, he seemed to predict the subject matter and aesthetics of photography in the future. Some works by Degas show an uncanny affinity to the accidental compositions of candid photography and street reportage, almost before these genres arrived. Look at his painting of the Place de la Concorde with its strangely cut off figures entering and leaving the frame. With its complete lack of “bella figura”, the aestheticised harmony of classical painting, it’s more like an offbeat street photograph by Lee Friedlander in the 1970s than a painting by a trained artist in the 1870s. There’s no indication yet if the exhibition will include his photography or draw attention to the influence photography had on his painting. But it will still be an opportunity to see the original works and know that many were fertilized by the young medium. It will be interesting to speculate on which ones contain that seed. Degas: A New Vision will open at the NGV in St Kilda Road on June 24, 2016. 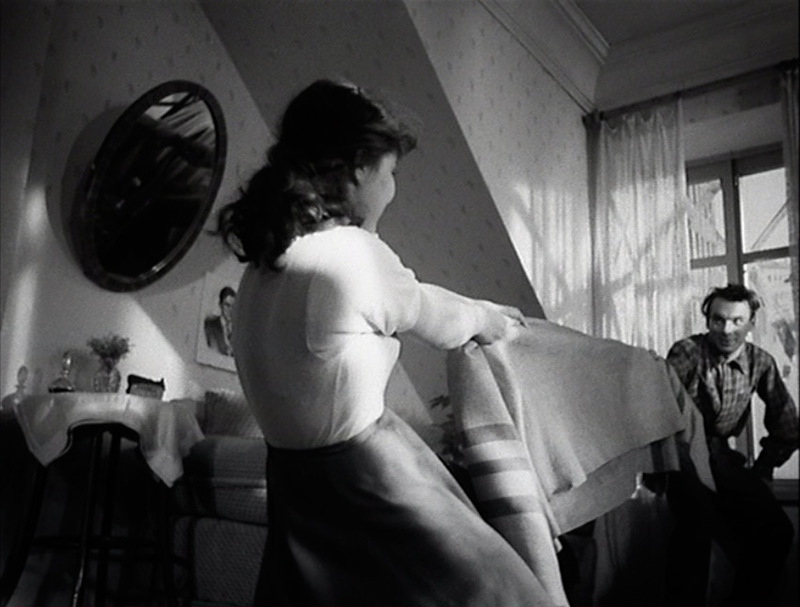 The Cranes are Flying is a Russian film that took the cinema world by storm in the 1950s. 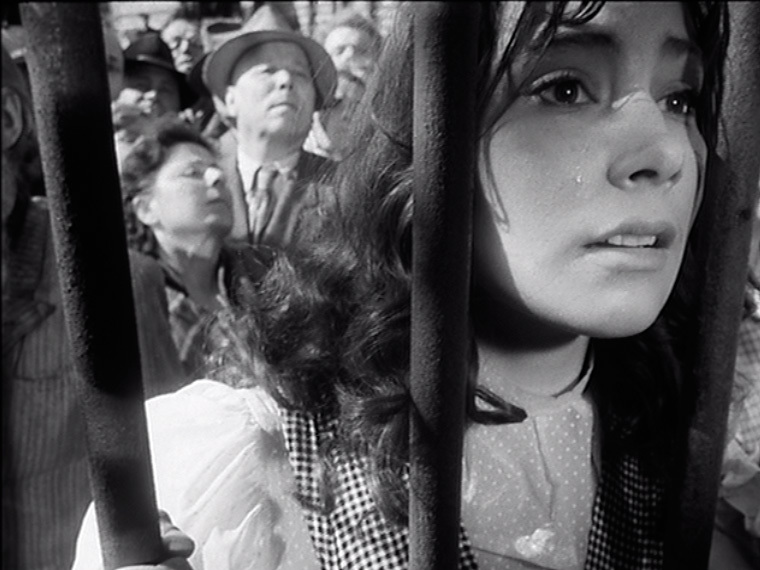 After electrifying audiences inside the Soviet Union it went on to great success in the West despite the Cold War atmosphere, winning the Palme D’Or at Cannes in 1958. 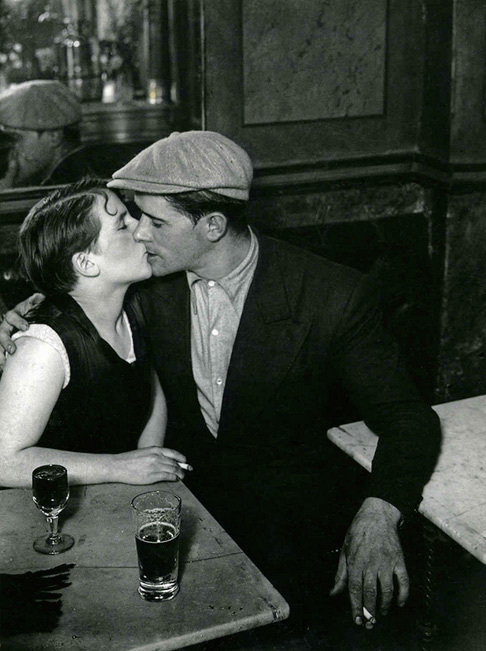 Focussing on two young lovers at the start of World War II, its emotional intensity is matched by great artistic bravado. 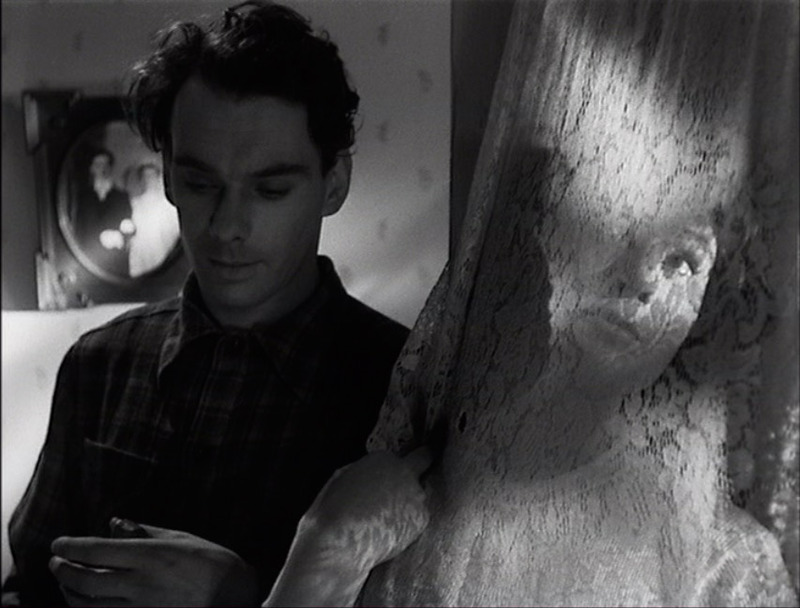 The cinematographer was Sergei Urusevsky who made several films with director Mikhail Kalatozov, all of them marked by a radical visual style. Urusevsky was a controversial artist in the Soviet era because of the overt artistic quality of his camera work. He was labelled a formalist, preoccupied with artistic effects, a dangerous accusation in the era of Soviet Realism where communist propaganda was seen as the role of art. 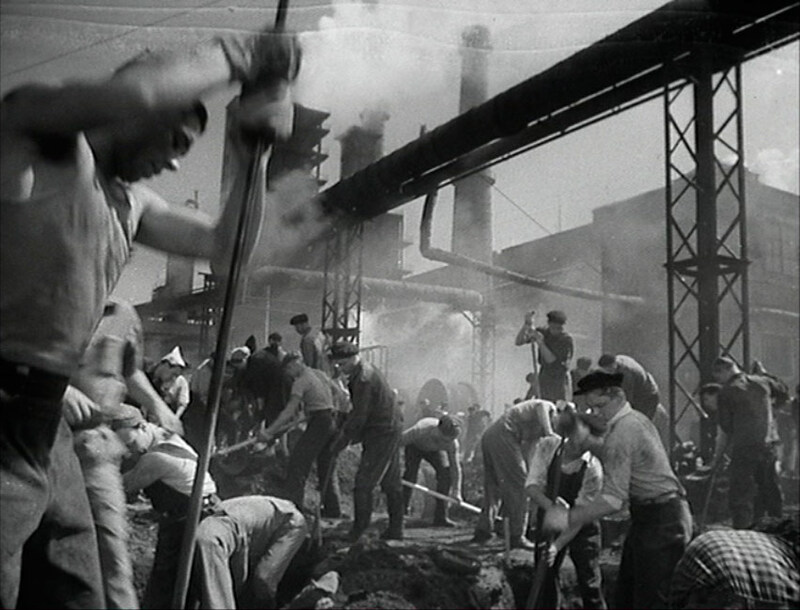 Cranes has one of the great individual shots in cinema history, a tour-de-force of camera operating, performance and the coordinating of extras and machines. The protagonist Veronika is desperately trying to reach her lover who is about to march off to war, but her bus is held up in traffic. In a single handheld shot we follow up-close as she gets up and leaves the bus, rushes through the melée of crowds and vehicles then runs between moving tanks in a military parade. Imagine yourself as the camera operator manouvering inside the bus, following the actress through the crowd, then stepping onto a waiting platform and being hoisted up in the air by a crane. When you see this shot, you’ll realize the title of the film has another meaning altogether! This unsettling photograph has appeared on Shorpy.com, the online archive of vintage photographs. 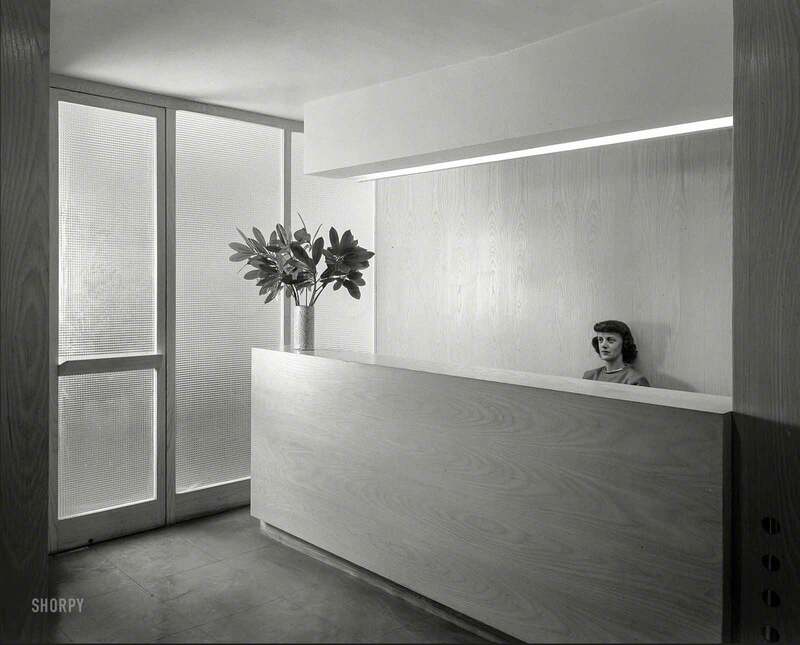 It was taken in 1948 for the office of Russel Wright, the esteemed mid-century American designer. His modern industrial design was not unlike that of Charles and Ray Eames, organic, playful and contemporary. So it’s a mystery why such a sterile image was deemed suitable to promote the business. 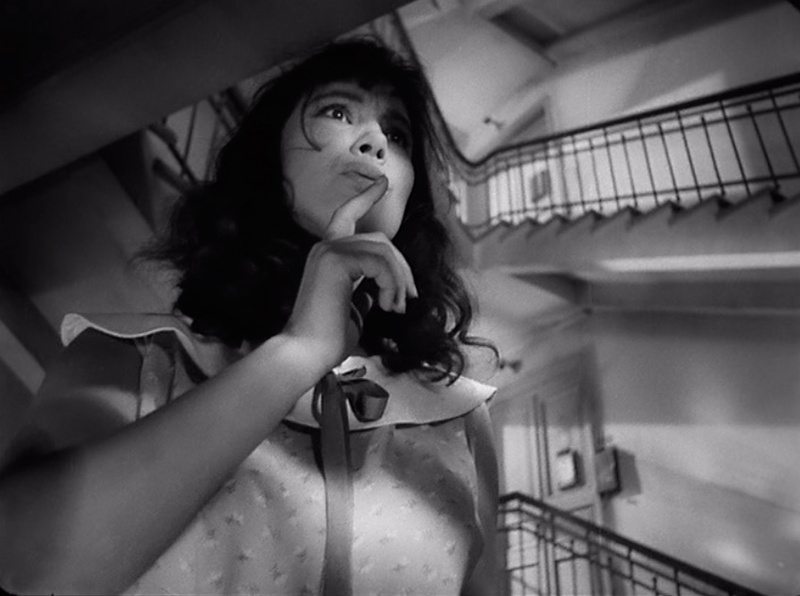 It has such a rare blankness it’s a treasure, a perfect depiction of 20th century urban alienation. Presumably these qualities were not intended. 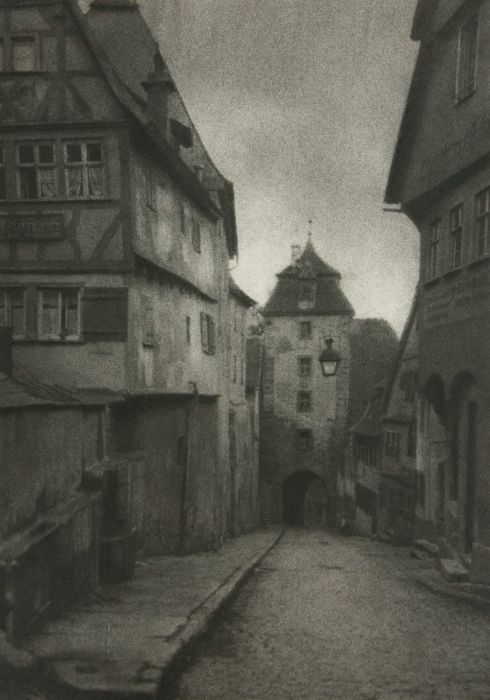 It was taken by Gottscho-Schleisner, Inc, the architectural photography studio whose work often achieved a high degree of clarity and technical perfection. No doubt the photographer was just trying to do a neat job, and asked the secretary to keep very still during the exposure. Whatever the explanation, I’m sure one day it will appear on the cover of George Orwell’s 1984 or some other dystopian novel. After all, the photograph was taken in 1948, the year Orwell wrote his novel, naming it by simply re-arranging the numbers of the year.